KalaK Amplifier is now WA 2.9.x ready. 6 different colors available in this pack. Excellent work! I like this one a lot! god i have waited for this one for ages..
Wow, this is an absolutely fantastic looking skin. The quality, look, and feel are all top notch, and I absolutely applaud your attention to detail. The EQ sliders, volume slider, and the entirety of the main window looks amazing, and I love the fact you even skinned the media library. There aren't nearly enough truly good skins out there that do that, so you're among the select few. My personal favorite color variations are blue and ESPECIALLY the gold. The gold one is EXCELLENT, and I'm thinking about changing my desktop just to match it. Although, I think the red one could be just a little bit better... Perhaps, well, a little bit more red. It looks a little purple-ish right now. Though, if you just renamed it Fucshia or Raspberry then you could say the skinpack contains 7 skins, since the color is nice in and of itself... Just not red enough for my liking. All in all, this is definately a wonderful skin, and I'll be using it for quite a while to come. Thank you so much for making and sharing such a great skin. Can this skin be used with WinAMp5 beta? Yes just copy the .wsz files to your wa5 beta /skins directory. The "LIB" button works in beta 1 but has changed back to the old "about winamp" function in beta 2. anything else's working. WA 5 supports wa 2+3 skins hence the name winamp 5. Haven't tried with the newer beta version but I'm sure it'll work. 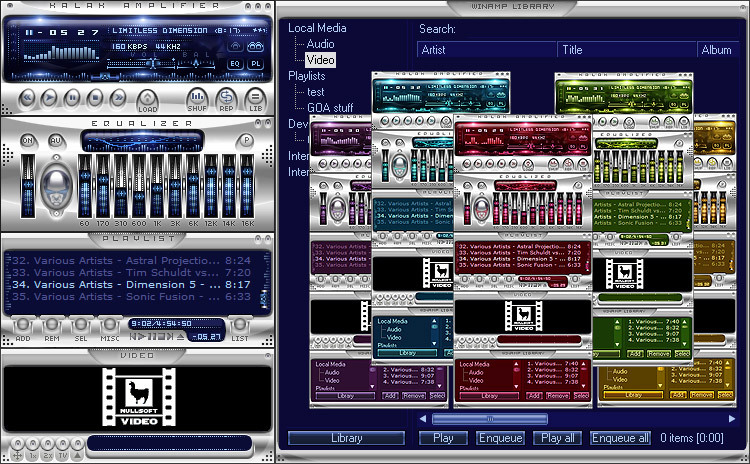 This is, hands down, in my opinion, the single most unbelievable Winamp 2.9x skin ever created! It's been my default skin since it was released... Sure I may stray, but I'll always come back! My only wish was that the red wasn't so maroon and more red, but that doesn't really matter since the blue is my favorite and absolutely stunning! IMHO, on a par with the great MMD3 except showing more talent due to Winamp 2.9's limits. Bravo and many thanks from me! nice work. only criticism is that the eq slider knobs are too close in looks to the sliders. Makes it all a little too busy imho. Still a great skin though. These are REALLY crisp. The preview doesn't do them justice. This is so amazing!I love it. the best skin for winamp... I had an old version of this skin without the library skinned part.. but this have the library skin.. great job!!.. The quality is superB until today 2006. ^^ but where is the author now? missing in action? still waiting for his new release until now. =_="